The PBJ & Jazz summer series is pleased to return to the Topiary Park downtown for its third season of free outdoor concerts. PBJ & Jazz at the Topiary Park: Jazz for Kids and Families is a collaborative effort between the Jazz Arts Group, Friends of the Topiary Park, Friends of the Library, and the Columbus Museum of Art. On Saturday June 11th, Matt and Natalie Adams will be performing. 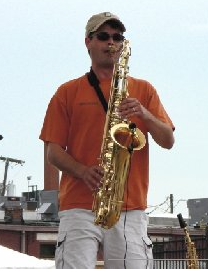 Matt, a graduate of Capital University, is a professional saxphonist with over 20 years of performing experience. Matt plays regularly in Columbus with the New Basics Brass Band and his own Matt Adams Quartet. This performance features Matt along side his wife, Natalie. PBJ & Jazz at the Topiary Park concerts are free and follow family story-time at 11:00 AM at the Main Library. Guests are encouraged to bring a picnic and a blanket. The noon concert will conclude with a hands-on art activity, from 1:00 – 2:00 PM, presented by the Columbus Museum of Art. The Topiary Park is located at 480 E. Town Street in downtown Columbus. In the event of rain, concerts and art activities will be held inside the Main Library at 96 S. Grant Avenue. Call 614-294-5200 x 107 for more information. Next post: Bungalow Jazz Shows Return this Friday with Bryan Olsheski & more..